Text: Many and many a night has passed since the walls of the Park have witnessed such a scene. Fanny Ellsler [sic], the bright star whose rising in our firmament has been anxiously looked for by the fashionable astronomers since its transit across the ocean was announced, shone forth in all its brilliancy this evening. Her reception was the warmest and most enthusiastic I ever witnessed. On her first appearance, in a pas seul called la Cracovienne which was admirably adapted to set off her fine figure to advantage, the pit rose in a mass, and the waves of the great animated ocean were capped by hundreds of white pocket-handkerchiefs. The dance was succeeded by a farce, and then came the ballet “La Tarantule,” in which the Ellsler [sic] established her claim to be considered by far the best dancer we have ever seen in this country. At the falling of the curtain she was called out; the pit rose in a body and cheered her, and a shower of wreaths and bouquets from the boxes proclaimed her success complete. She appeared greatly overcome by her reception, and coming to the front of the stage, pronounced, in a tremulous voice, in broken English, the words “A thousand thanks,” the naiveté of which seemed to rivet the hold she had gained on the affections of the audience. All the boxes were taken several days since, and in half an hour after the time proclaimed for the sale of pit tickets the house was full, so that when we arrived, which was a full hour before the time of commencing the performance, placards were exhibited with the words “Pit full,” “Boxes all taken.” This wise arrangement prevented confusion. The house, although full in every part, was not crowded, and a more respectable audience never greeted the fair danseuse in any country she has charmed. Comments: Philip Hone (1780-1851) was an American businessman and diarist, who was Mayor of New York 1825-1826. 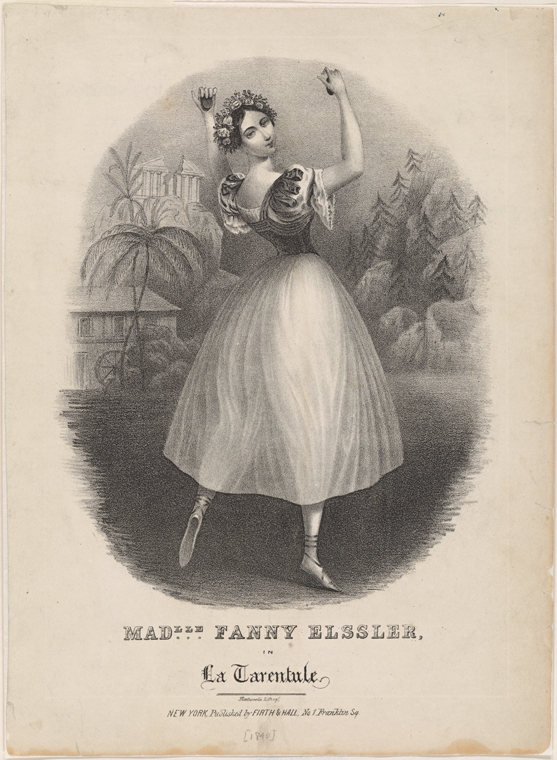 Fanny Elssler (1810-1884) was an Austrian ballerina, considered to be one of the finest dancers of the Romantic ballet period. After much success in Europe, she toured the USA for two years from 1840, with her dancer sister Therese. Text: Miss Ellen Tree made, this evening, her first appearance in America, at the Park Theatre, in the character of Rosalind in “As You Like It,” and Pauline in a sort of melodrama called “The Ransom.” Her Rosalind was a most fascinating performance, full of grace and refinement and the part well adapted to her style of acting. The play, admirable as it is, and abounding in Shakespeare’s finest passages and most touching sentiments, is usually tiresome in the performance, and can be best appreciated in the closet; but on this occasion sweet Rosalind was so ably supported by all the other characters that it went off delightfully. The charming debutante was well received by a prodigiously crowded house, and was saluted by cheers and waving of hats and handkerchiefs. I was struck again, as in London, by the great resemblance of Ellen Tree to my daughter Mary. Her profile is much like hers, and her smile so like that it almost overpowered my feelings; they are both pretty well off for nose, neither being of the kind called “snub” by any means; “quite to the contrary, I assure you,” as Temple Bowdoin says; but Mary’s eyes are finer and more expressive than Miss Tree’s. Fanny Kemble was right in this matter. Comments: Philip Hone (1780-1851) was an American businessman and diarist, who was Mayor of New York 1825-1826. He saw Shakespeare‘s As You Like It at the Park Theatre, New York, 9 December 1836. The British actress Ellen Tree (1805-1880) was known professionally as Mrs Charles Kean after her marriage in 1842. Comments: Philip Hone (1780-1851) was an American businessman and diarist, who was Mayor of New York 1825-1826. He saw Hamlet at the Park Theatre, New York, 17 September 1832. The British actor Charles Kemble visited America in 1832 and 1834, accompanied by his actress daughter Fanny Kemble.